My son and I flew to Las Vegas to meet the rest of our group coming in from New Hampshire. The following day we drove west, arriving at the Onion Valley trailhead around lunchtime. A word of warning on Bear Canisters. You can rent for $5.00 per trip from the Whitney Ranger station. At the trailhead it will cost you $5.00 per day. As it turned out, we encountered no bears during the seven days of our trip. Hopefully the tight restrictions on food storage are working. The first night we camped at Robinson Lake. We found it a good first camp after leaving the trailhead at 2:00pm. The next morning under clear skies we picked our way up University Pass. The route was snow free. Having now done it with and without snow, we all decided snow would have been better. There was an abundance of loose rock on the ascent. We arrived at the top of the pass around noon and three of us went on to summit University Peak. Note: If you keep well west of the ridge, you won't be faced with as many as four false summits! We didn't figure this out until on the way back to the pass. The decent from the pass is tricky. There are actually two parallel chutes, which drop steeply into Center Basin. When descending, we chose the chute on the left. It sports huge amounts of steep loose rock! The chute on the right is just as steep, however it appears to have a cliff of 15 feet or so about midway down. We arrived at a nice camp in Center Basin around 5:00pm. Everyone had scraped legs and boots full of sand and rock! That evening, the mountains and ridges glowed in orange and pink before the star filled sky inked out the brilliant landscape. Tuesday was spent lazing around, some fished and others did some bouldering or reading. That evening the weather shifted and became locked in a nasty pattern for the rest of the week. Our plans had included Mt. Stanford and Mt. Bradley. We never had a break long enough to try either. We turned back on our first try at Center Peak. A quickly building thunderstorm dropped over the summit and we scurried off! Thursday we had hard rain again in the morning. 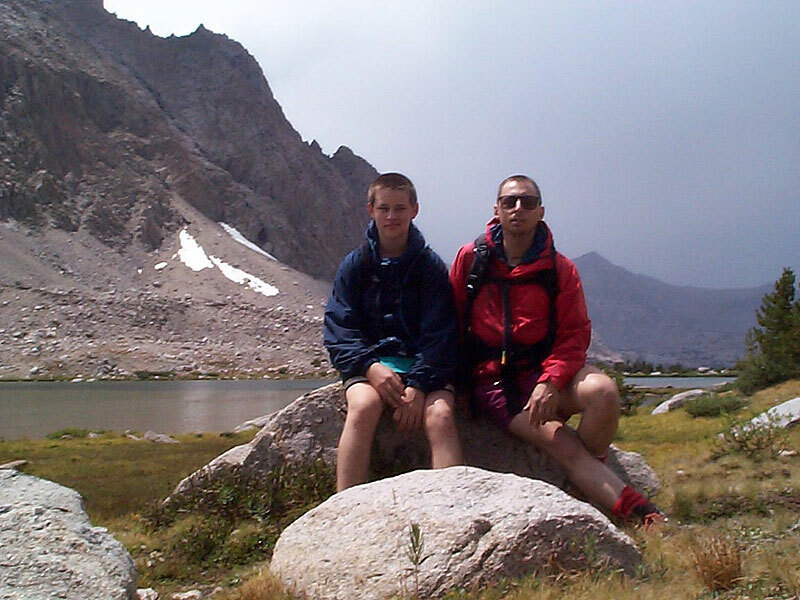 As soon as it broke, my son Julian and I made for the East Ridge of Center Peak again. This time we summited, making the round trip in about three hours! On the summit I snapped a good picture for anyone interested in the east face route on Mt. Stanford. We arrived in camp just in time for a real lashing of a storm. We stayed tent bound until around 6:00pm. We could see that the weather was finally breaking. That night the stars filled the sky in classic Sierra fashion! Friday we enjoyed a leisurely hike from Center Basin to the Kearsarge lakes. The views were breathtaking the entire way. A real highlight on Friday was watching and photographing several Mule Deer grazing in the thickets near our camp. Saturday we finished the hike over Kearsarge pass and arrived back at our car before noon. The weather was fickle, we did not reach some of our goals, but the company was great and you know what they say...a bad day in the mountains is ten times better that a good day in the flat lands. I have many images of Center Basin and the surrounding summits and passes. If you would like to see them please send me email.